Rigged for Murder by Jenifer LeClair: Synopsis and Online Purchase Options. Synopsis (from the publisher): Fighting post-traumatic stress after being shot, Minneapolis homicide detective Brie Beaumont takes a leave from the department and heads for Maine where her family has roots and for the sea where she feels at home. She ships out on the Maine Wind for an early season cruise with Captain John DuLac and eight others. Caught in a gale, they anchor off remote and windswept Granite Island. 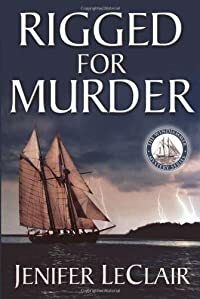 But there's more trouble brewing than just a bad storm, and when someone aboard is murdered, Brie reluctantly resumes the mantle of investigator. The action moves from the ship to the small fishing village of Lobsterman's Cove and, from there, to the forests and cliffs of Granite Island. Snug Harbor Bed and Breakfast affords refuge to the sailors and a place for Brie to question the passengers. Plagued by flashbacks, and fighting a growing attraction to Captain DuLac, she works to unravel a mystery that will place her directly in the path of a psychopathic killer.